We have a vast selection of id badge holders and accessories. From vinyl strap clips to O'rings and luggage tags. If you require something other than the vinyl strap clips, be sure to contact us. The most popular strap clip made from a 2.75" clear lightweight vinyl will attach your id to most anything. Consist of a metal spring clip with 2 holes in clip and durable metal snap on the other. Use by sliding through a slot on card holder. The hardware end can then be attached to either clothing or a lanyard with almost any attachment. Replacement straps clips are made from a 2.75" clear lightweight vinyl strap. They consist of a metal spring clip on one end and durable metal snap on the other. They work by sliding through a slot on card holder. The hardware end can then be attached to either clothing or a lanyard with o-ring. Hooks are available in both metal and plastic. Metal snaphooks offer the greatest size selection. The most common snaphooks have attachments for 3/8" cord, 1/2", 3/4" and 1.0" flat lanyard material. Nickel plated brass is the most popular, but stainless steel is also available. Can be used as zipper pull. Metal swivel snaphooks offer the ease of turning and twisting without winding up your lanyard. Nickel plated brass is the most popular, but stainless steel is also available. Bulldog clips work via a spring. Squeeze on one end and they open like jaws on the other. Available with 3/8", 1/2", 3/4" and 1.0" lanyard attachment hardware. Both solid and split o-rings are being used. Metal o-rings are used for attaching the bulldog end strap clips. 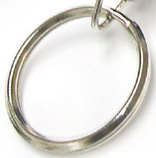 Split rings can be used for the same purpose as well to hold keys or badge holders. Available in many stock sizes from 9mm to 56mm. Available in both aluminum and semi-rigid vinyl with a clear front window. Sized to hold business cards. Back can be custom printed with company name, logo or message. 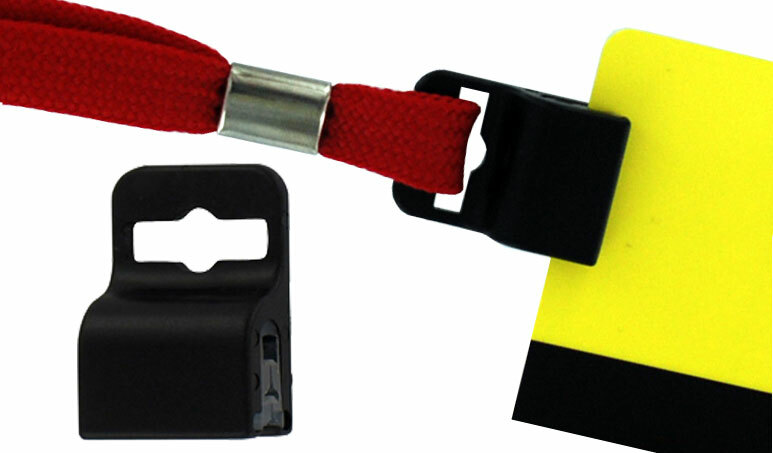 Luggage straps are available in flexible plastic loops, semi-rigid plastic and leather. Plastic loops are available in 6" and 9" and a variety of colors. Leather straps add an upscale image to any luggage tag. Available in a variety of lengths and colors. Loud metal safety whistles can be attached to most neck id badge holders. Made from anodized aluminum in many colors. Custom laser engraved with company name, logo or message. 2 Sizes and 5 colors to choose from. Versatile holder for slot-free security cards. No holes required, helps prevent damage to the smart chips and circuitry in the badges from slots. Silicone inner core securely holds cards with up to 5 lbs. of force. Opening accommodates lanyards, strap clips and badge reels. Comes in black or white and is customizable on the front. For more gripper info and cost click link here. Features with or without a safety breakaway. Optional bead adjuster. Suitable style for coaches and referees. 3/16" Nylon cords comes in black, navy, red, royal, hunter, purple and maroon. Your choice of hardware attachments as all the ones shown above. Minimum Order is only 50pcs. 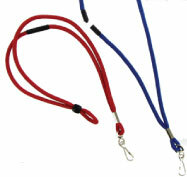 Let us know if you need custom PMS color or special length lanyards. Length or size adjustors are available as a simple bead or with push button lock. Most common are small black beads with a single 0.25" dia. hole or a square double barrel with 1/8" holds for cord lanyards. Locking adjustors are available in both round and square shapes. Most popular colors are black and white. Some varieties of adjustors have a small area for a custom imprint. This handy quick disconnect has multiple uses. Thin lanyard to attach to portable objects such as USB drives, cell phones, digital cameras, etc. Has a quick release mechanism to detach quickly and easily. Approximately 1-1/2" lanyard length.